The Coral Sea is also ranked in the top ten Aussie spots to dive. The Coral Sea Reefs are not a part of the Great Barrier Reef, but rather separate pinnacle of sea mounts rising from the Pacific Ocean bed off from the Continental Shelf. 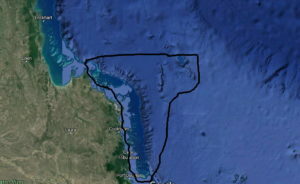 The area in the outline shows predominantly where the Coral Sea dives take place. The normally planned trips follow the Ribbon Reefs up to the Cod Hole and then out to Osprey Reef and then back to port via the Ribbon Reefs again. Situated 150 km out from the Great Barrier, the Coral Sea area is huge, with many untouched reefs rarely visited by divers. The underwater visibilty and marine life is truly superb, and diving here is spectacular. The 150 000 sq km of reefs in the Coral Sea is one of the richest and most diverse coral reef areas in the world. It supports the largest congregation of different species in the Pacific. Visibility frequently exceeds 70 metres, which is outstanding in itself. Corals are excellent here, with hard and soft corals, sponges, sea whips, grasses, algaes and millions of other species of life living in the warm, clear waters. The main reefs visited are Osprey, Holmes, Bouganville, Flinders, Marion, Lihou, Coringa and Diamond Island. To dive the Coral Sea, divers must make their way on a live aboard dive vessel. There are a number of operators and such trips can be organised for individuals and groups alike.